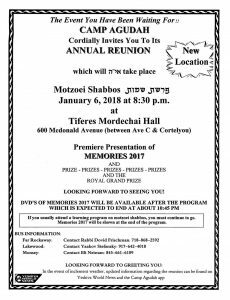 The Camp Agudah Reunion will take place on Motzei Shabbos January 6, 2018 at Tiferes Mordechai Hall (600 McDonald Avenue) starting at 8:30 PM. Camp Agudah Productions Presents: So Grateful! Huge mazal tov to Chaim Fogel on his marriage to Rivky Braunstien!!!!!!!!! !